Many coaches object to the call for sportsmanship because they see it as outmoded. Kids are different today, so you can’t coach them the same way that we were coached when we were kids. Other successful coaches let their players trash-talk or vent their emotions, so why shouldn’t I? Why can’t coaches let players be themselves? Why Respect Teammates and Team? How does "team magic" come about? There are no guarantees, but it requires the genuine respect of the team members for each other and for the team. Coaches who take the moral education of young athletes seriously must teach them respect for the game. If you are a coach, you have authority over your players--the more authority, the more responsibility. In an era when our nightly news is filled with reports of athletes run amok on the field, on the court, and on the street, and when cheating by players and coaches has become a part of the daily discourse, sportsmanship has never been a more timely topic. • 34% of boys surveyed and 12% of girls surveyed approve of a coach trying to pump up the team by swearing at officials to get ejected from the game. These statistics illustrate the importance of clarifying the boundaries of healthy competition and modeling the principles of fair play. Sport and Character: Reclaiming the Principles of Sportsmanship can help those involved in sport tackle the important lessons of sportsmanship by encouraging them to practice and teach respect for opponents, coaches, officials, teammates, and the game. Using examples from common situations that occur on and off the field, Sport and Character brings to life what is required in order to be a good sport. Special “News Breaks” incorporated throughout the text present practical examples of sportsmanship drawn from current sport news, including articles about Michael Phelps, Shawn Johnson, Jimmy Rollins, and Nastia Liukin. Inspirational quotes by Phil Jackson, John Wooden, and Mickey Mantle add vitality to this tool for building good athletes and in turn good citizens. Sport and Character: Reclaiming the Principles of Sportsmanship is endorsed by the American Sport Education Program (ASEP). Established by world-renowned sport psychologist Rainer Martens, ASEP has trained more than 1.5 million coaches since its inception in 1981. A reference for coaches of youth, high school, and college athletes. 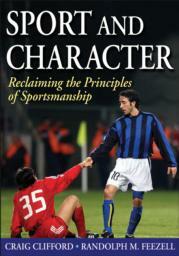 Also a supplemental book for students studying sport ethics, current issues in sport, and sport management. The book will resonate with school administrators, parents, sport administrators, college presidents, Olympic officials, sport officials, and anyone who cares about sport and its relation to character and culture. Craig Cliffordis professor of philosophy and director of the honors programs at Tarleton State University in Stephenville, Texas. Clifford received a PhD in philosophy from the State University of New York at Buffalo in 1981. He has an extensive background in teaching ethics and philosophy of sport, both at the undergraduate and graduate level. A frequent guest columnist for several major newspapers, Clifford has frequently written on the subject of sportsmanship and the American sports culture. He is also the author ofLearned Ignorance in the Medicine Bow Mountains: A Reflection on Intellectual Prejudice(Rodopi, 2008), The Tenure of Phil Wisdom: Dialogues (University Press of America, 1995), andIn the Deep Heart’s Core: Reflections on Life, Letters, and Texas (Texas A&M University Press, 1985). From 1988 to 1992 Clifford coached the men’s and women’s tennis teams at Tarleton State University. He has competed in a number of sports. Taking up the sport of Olympic-style target archery in his mid-40s, he won the state outdoor archery championship in 1997 and finished the 1999 season ranked 26th in the nation. Randolph Feezell is professor of philosophy at Creighton University in Omaha, Nebraska. Feezell received a PhD in philosophy from the State University of New York at Buffalo in 1977. He is an award-winning teacher at Creighton University; his classroom and research interests include ethics, philosophy of religion, and philosophy of sport. He is a member of the editorial board of the Journal of the Philosophy of Sport. Feezell is the author ofSport, Play, and Ethical Reflection (University of Illinois Press, 2004) andFaith, Freedom, and Value: Introductory Philosophical Dialogues (Westview Press, 1989). He is the coauthor, with Curtis Hancock, of How Should I Live? Philosophical Conversations About Moral Life(Paragon House, 1991). He has also published numerous articles and reviews. Feezell played baseball at the University of Oklahoma. He has coached baseball at virtually all levels, including over 10 years as a college assistant and hitting coach. He has played semiprofessional baseball, AAU basketball, and tournament tennis. Can sportsmanship make a come-back?